Three executives at Samsung Electronics have agreed to plead guilty on charges of conspiring to fix the price of computer memory chips. The three men each agreed to serve terms of between seven and eight months in prison and to each pay a fine of $250,000 (£143,000). The long-running US government probe has resulted in more than $731m in fines against 12 people and four firms. These included Samsung, Elpida Memory, Infineon and Hynix Semiconductor. The US government said a price fixing conspiracy had driven up the price of DRAM chips, the most commonly used product for storing and retrieving information in computers and electronic devices. Companies such as Dell, Hewlett-Packard and IBM said they had to raise PC prices or limit the amount of memory installed on their systems to offset the higher costs of computer chips. The Korean Samsung executives who agreed to the guilty pleas were Sun Woo Lee, senior manager of DRAM sales, Yeongho Kang, associate director of DRAM marketing for Samsung's US arm and Young Woo Lee, sales director for its German division. "These pleas should send a clear message that we will hold accountable all conspirators, whether domestic or foreign, that harm American consumers through their illegal conduct," said Attorney General Alberto Gonzales. 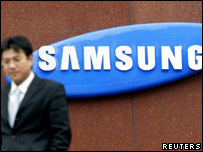 Samsung is the world's largest maker of DRAM chips. In response to the guilty pleas Samsung said it was "strongly committed to fair competition and ethical practices and forbids anticompetitive behaviour".